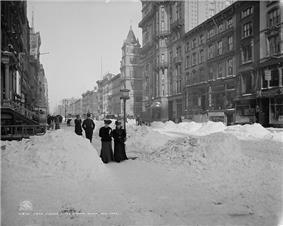 The lower stretch of Fifth Avenue extended the stylish neighborhood of Washington Square northwards. The high status of Fifth Avenue was confirmed in 1862, when Caroline Schermerhorn Astor settled on the southwest corner of 34th Street, and the beginning of the end of its reign as a residential street was symbolized by the erection, in 1893, of the Astoria Hotel on the site of her house, later linked to its neighbor as the Waldorf-Astoria Hotel (now the site of the Empire State Building). 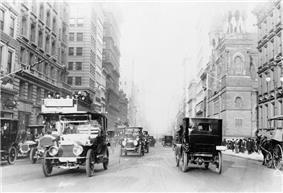 Fifth Avenue is the central scene in Edith Wharton's 1920 Pulitzer Prize winning novel The Age of Innocence. The novel describes New York's social elite in the 1870s and provides historical context to Fifth Avenue and New York's aristocratic families. Originally a narrower thoroughfare, much of Fifth Avenue south of Central Park was widened in 1908, sacrificing its wide sidewalks to accommodate the increasing traffic. The midtown blocks, now famously commercial, were largely a residential district until the start of the 20th century. The first commercial building on Fifth Avenue was erected by Benjamin Altman who bought the corner lot on the northeast corner of 34th Street in 1896, and demolished the "Marble Palace" of his arch-rival, A. T. Stewart. In 1906 his department store, B. Altman and Company, occupied the whole of its block front. The result was the creation of a high-end shopping district that attracted fashionable women and the upscale stores that wished to serve them. Lord & Taylor's flagship store is still located on Fifth Avenue near the Empire State Building and the New York Public Library. Fifth Avenue originates at Washington Square Park in Greenwich Village and runs northwards through the heart of Midtown, along the eastern side of Central Park, where it forms the boundary of the Upper East Side and through Harlem, where it terminates at the Harlem River at 142nd Street. Traffic crosses the river on the Madison Avenue Bridge. Fifth Avenue serves as the dividing line for house numbering and west-east streets in Manhattan, just as Jerome Avenue does in the Bronx. It separates, for example, East 59th Street from West 59th Street. From this zero point for street addresses, numbers increase in both directions as one moves away from Fifth Avenue, with 1 West 59th Street on the corner at Fifth Avenue, and 300 West 59th Street located three blocks to the west of it. The section of Fifth Avenue that crosses Midtown Manhattan, especially that between 49th Street and 60th Street, is lined with prestigious shops and is consistently ranked among the most expensive shopping streets in the world. The "most expensive street in the world" moniker changes depending on currency fluctuations and local economic conditions from year to year. For several years starting in the mid-1990s, the shopping district between 49th and 57th Streets was ranked as having the world's most expensive retail spaces on a cost per square foot basis. In 2008, Forbes magazine ranked Fifth Avenue as being the most expensive street in the world. Some of the most coveted real estate on Fifth Avenue are the penthouses perched atop the buildings. The American Planning Association (APA) compiled a list of "2012 Great Places in America" and declared Fifth Avenue to be one of the greatest streets to visit in America. This historic street has many world-renowned museums, businesses and stores, parks, luxury apartments, and historical landmarks that are reminiscent of its history and vision for the future. In addition, the cooperative apartment building at 2 Fifth Avenue was named a New York cultural landmark on December 12, 2013 by the Historic Landmark Preservation Center, as the last residence of former New York City Mayor Ed Koch. Fifth Avenue from 142nd Street to 135th Street carries two-way traffic. Fifth Avenue carries one-way traffic southbound from 135th Street to Washington Square North. The changeover to one-way traffic south of 135th Street took place on January 14, 1966, at which time Madison Avenue was changed to one way uptown (northbound). From 124th Street to 120th Street, Fifth Avenue is cut off by Marcus Garvey Park, with southbound traffic diverted around the park via Mount Morris Park West. Fifth Avenue is one of the few major streets in Manhattan along which streetcars did not operate. Instead, Fifth Avenue Coach offered a service more to the taste of fashionable gentlefolk, at twice the fare. On May 23, 2008, The New York Times reported that the New York City area Metropolitan Transportation Authority's bus division is considering the use of double-decker buses on Fifth Avenue once again, where they were operated by the Fifth Avenue Coach Company until 1953, and again by MTA from 1976 to 1978. Fifth Avenue is the traditional route for many celebratory parades in New York City; thus, it is closed to traffic on numerous Sundays in warm weather. 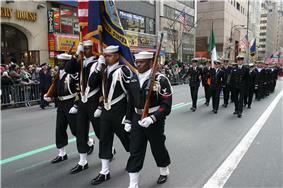 The longest running parade is the annual St. Patrick's Day Parade. Parades held are distinct from the ticker-tape parades held on the "Canyon of Heroes" on lower Broadway, and the Macy's Thanksgiving Day Parade held on Broadway from the Upper West Side downtown to Herald Square. Fifth Avenue parades usually proceed from south to north, with the exception of the LGBT Pride March, which goes north to south to end in Greenwich Village. The Latino literary classic by New Yorker Giannina Braschi, entitled "Empire of Dreams," takes place on the Puerto Rican Day Parade on Fifth Avenue. Bicycling on Fifth Avenue ranges from segregated with a bike lane south of 23rd Street, to scenic along Central Park, to dangerous through Midtown with very heavy traffic during rush hours. There is no dedicated bike lane along Fifth Avenue. In July 1987, then New York City Mayor Edward Koch proposed banning bicycling on Fifth, Park, and Madison Avenues during weekdays, but many bicyclists protested and had the ban overturned. When the trial was started on Monday, August 24, 1987 for 90 days to ban bicyclists from these three avenues from 31st Street to 59th Street between 10 a.m. and 4 p.m. on weekdays, mopeds would not be banned. On Monday, August 31, 1987, a state appeals court judge halted the ban for at least a week pending a ruling after opponents against the ban brought a lawsuit. In the late 19th century, the very rich of New York began building mansions along the stretch of Fifth Avenue between 59th Street and 96th Street, looking onto Central Park. By the early 20th century, this portion of Fifth Avenue had been nicknamed "Millionaire's Row", with mansions such as the Mrs. William B. Astor House, William A. Clark House, Felix M. Warburg House, two Morton F. Plant Houses, James B. Duke House and numerous others (see Category:Fifth Avenue (Manhattan), below). Entries to Central Park along this stretch include Inventor's Gate at 72nd Street, which gave access to the park's carriage drives, and Engineers' Gate at 90th Street, used by equestrians. A milestone change for Fifth Avenue came in 1916, when the grand corner mansion at 72nd Street and Fifth Avenue that James A. Burden II had erected in 1893 became the first private mansion on Fifth Avenue above 59th Street to be demolished to make way for a grand apartment house. The building at 907 Fifth Avenue began a trend, with its 12 stories around a central court, with two apartments to a floor. Its strong cornice above the fourth floor, just at the eaves height of its neighbors, was intended to soften its presence. In January 1922, the city reacted to complaints about the ongoing replacement of Fifth Avenue's mansions by apartment buildings by restricting the height of future structures to 75 feet (23 m), about half the height of a ten-story apartment building. Architect J. E. R. Carpenter brought suit, and won a verdict overturning the height restriction in 1923. Carpenter argued that "the avenue would be greatly improved in appearance when deluxe apartments would replace the old-style mansions." Led by real estate investors Benjamin Winter, Sr. and Frederick Brown, the old mansions were quickly torn down and replaced with apartment buildings. This area contains many notable apartment buildings, including 810 Fifth Avenue and the Park Cinq, many of them built in the 1920s by architects such as Rosario Candela and J. E. R. Carpenter. A very few post-World War II structures break the unified limestone frontage, notably the Solomon R. Guggenheim Museum between 88th and 89th Streets. Museum Mile is the name for a section of Fifth Avenue running from 82nd to 105th streets on the Upper East Side, in an area sometimes called Upper Carnegie Hill. The Mile, which contains one of the densest displays of culture in the world, is actually three blocks longer than one mile (1.6 km). 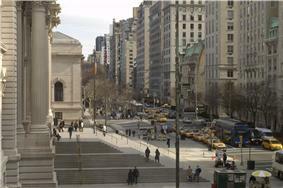 Nine museums occupy the length of this section of Fifth Avenue. A tenth museum, the Museum for African Art, joined the ensemble in 2009; its Museum at 110th Street, the first new museum constructed on the Mile since the Guggenheim in 1959, opened in late 2012. In addition to other programming, the museums collaborate for the annual Museum Mile Festival to promote the museums and increase visitation. The Museum Mile Festival traditionally takes place here on the second Tuesday in June from 6 – 9 p.m. It was established in 1979 to increase public awareness of its member institutions and promote public support of the arts in New York City. The first festival was held on June 26, 1979 (1979-06-26). The ten museums are open free that evening to the public. Several of the participating museums offer outdoor art activities for children, live music and street performers. During the event, Fifth Avenue is closed to traffic. Additionally, on the corner of Fifth Avenue and 70th Street lies the Henry Clay Frick House which houses the Frick Collection, though this is not part of Museum Mile. Between 49th Street and 60th Street, is lined with prestigious boutiques and flagship stores and is consistently ranked among the most expensive shopping streets in the world. 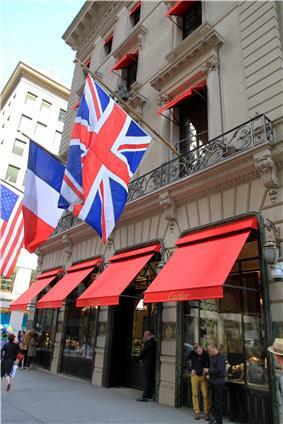 Most of the world's luxury boutiques are located on Fifth Avenue, which include Louis Vuitton, Tiffany & Co., Gucci, Prada, Bottega Veneta, Armani, Fendi, Versace, Tommy Hilfiger, Cartier, Omega, Ralph Lauren, Chanel, Harry Winston, Salvatore Ferragamo, Nike, Escada, Swarovski, Bvlgari, Emilio Pucci, Ermenegildo Zegna, Diesel, Lacoste, Brooks Brothers, and many more. Fifth Avenue is home to luxury department stores Lord & Taylor, Saks Fifth Avenue & Bergdorf Goodman. Fifth Avenue is home to New York's fifth most photographed building, the Apple Store. Fifth Avenue is home to the largest Build-A-Bear Workshop in the world. Some lesser-scale retailers such as Best Buy, H&M and BCBG Max Azria can also be found on Fifth Avenue. Many airlines established ticketing offices along Fifth Avenue. In the years leading up to 1992, the number of ticketing offices along Fifth Avenue decreased. Pan American World Airways went out of business, while Air France, Finnair, and KLM moved their ticket offices to other areas in Midtown Manhattan. ^ a b "Fifth Avenue The World's Most Expensive Shopping Street (PHOTOS) (Subtext: "For the 9th year in a row, Fifth Avenue between 39th and 60th Streets ranks first among Cushman & Wakefield's Main Streets Across the World Report, according to the New York Post.")". HuffingtonPost.com, Inc. September 21, 2010. Retrieved October 23, 2010. ^ a b Foderaro, Lisa W. "Survey Reaffirms 5th Ave. at Top of the Retail Rent Heap", The New York Times, April 29, 1997. Retrieved February 5, 2008. ^ Great Places in America. Planning.org (February 24, 2011). Retrieved July 19, 2013. ^ Landmarks Preservation Commission – Home. Nyc.gov. Retrieved July 19, 2013. ^ Roberts, Sam (12 December 2013). "Koch’s Last Residence Is Named a Cultural Landmark". The New York Times. Retrieved 2015-05-14. ^ Kihbaconss, Peter. "5th and Madison Avenues Become One-Way Friday; Change to Come 7 Weeks Ahead of Schedule to Ease Strike Traffic 5th and Madison to Be Made One-Way Friday", The New York Times, January 12, 1966. Retrieved December 6, 2007. "The long-argued conversion of Fifth and Madison Avenues to one-way streets will start at 6 am. Friday seven weeks ahead of schedule to ease congestion caused by the transit strike." ^ Neuman, William "Step to the Rear of the Bus, Please, or Take a Seat Upstairs", The New York Times, Tuesday, May 23, 2008. ^ "Giannina Braschi". National Book Festival. Library of Congress. 2012. ’Braschi, one of the most revolutionary voices in Latin America today’ is the author of Empire of Dreams. ^ Marting, Diane (2010), “New/Nueva York in Giannina Braschi's 'Poetic Egg': Fragile Identity, Postmodernism, and Globalization”, Indiana: The Global South, pp. 167–182 . ^ New York City Cycling Map, New York City Department of City Planning. Retrieved April 27, 2009. ^ Dunham, Mary Frances. "Bicycle Blueprint – Fifth, Park and Madison", Transportation Alternatives. Retrieved April 27, 2009. ^ Yee, Marilynn K. "Ban on Bikes Could Bring More Mopeds", The New York Times, Tuesday, August 25, 1987. Retrieved April 27, 2009. ^ Higgins Jr., Chester. "Bike Messengers: Life in Tight Lane", The New York Times, Friday, September 4, 1987. Retrieved April 27, 2009. ^ The smallest apartment was a half-floor, of 12 rooms; 907 Fifth Avenue. ^ Kusisto, Laura (October 21, 2011). "Reaching High on Upper 5th Avenue". ^ "Museums on the Mile". Archived from the original on January 1, 2012. Retrieved June 24, 2011. ^ Sewell Chan (February 9, 2007). "Museum for African Art Finds its Place". 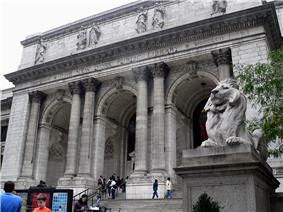 ^ "'"New Drive Promoting 5th Ave.'s 'Museum Mile. ^ New drive promoting Fifth Avenue's 'Museum Mile', The New York Times, June 27, 1979. ^ Fass, Allison and Murray, Liz (2000) "Talking to the Streets for Art" The New York Times June 11, 2000, p.17, col. 2. ^ Catton, Pia (June 14, 2011). "Another Delay for Museum of African Art". The Wall Street Journal. Retrieved June 24, 2011. ^ "Fifth Avenue The World's Most Expensive Shopping Street (PHOTOS) (Subtext: "For the 9th year in a row, Fifth Avenue between 49th and 60th Streets ranks first among Cushman & Wakefield's Main Streets Across the World Report, according to the New York Post.")". HuffingtonPost.com, Inc. September 21, 2010. Retrieved October 23, 2010. ^ "Manhattan Penthouse – 5th Ave and 14th Street". manhattanpenthouse.com/. Retrieved March 5, 2013. ^ "Store Profile- 44th and 5th". bestbuy.com. Retrieved June 12, 2012. ^ "POSTINGS: Air France Takes Flight; Au Revoir, Fifth Avenue." The New York Times. May 24, 1992. Page 101, New York Edition. Retrieved February 13, 2010. Gaines, Steven (2005). The Sky's the Limit: Passion and Property in Manhattan. New York: Little, Brown. "Museum Mile". NY.com. Retrieved February 22, 2013.